In the previous post in this series we wrote a couple of OWIN middleware components and chained them together. We actually achieved quite a lot in a low level console application: it hosts a simple web server which receives HTTP requests, it processes the requests with Katana components and performs some elementary logging. It’s now time to build an application on top of this environment. We’ll build upon the demo console app we’ve been working on so have it ready in Visual Studio. If you’ve read some other topics on this blog then you’ll note that I have a preference for the Web API as the server platform. So let’s see how we can build a Web API application on top of our little server. As the package name implies this package will help us host a Web API 2.1 app using OWIN components. The package installs a number of other components such as WebApi.Core WebApi.Client, JSON.NET, etc. Open the References section in the Solution Explorer. If you’ve worked with the Web API before then some of those new libraries will be familiar to you: System.Net.Http, System.Web.Http and the like. We want our web service to show the latest news. This will look very familiar to you if you’ve done any MVC and/or Web API programming – which you probably have otherwise you wouldn’t be reading this post. So we set up out first routing rule using the MapHttpRoute method like in the standard Web API app template of Visual Studio. Finally we call upon the built-in extension of the IAppBuilder interface to declare that we want to use the Web API. Now navigate to localhost:7990, i.e. without any controller name. You’ll see that our WelcomeComponent responds with “Hello from the welcome component”. The reason is that the web api component couldn’t route the request to any controller so it let the next component take over. The next component in the pipeline is the WelcomeComponent which happily responds to any request with the same message. We have just built the basics of a self hosted Web API application which is very light weight, easy to extend and responds to incoming HTTP requests with meaningful data. This package ensures that we can plug in our application into the ASP.NET pipeline. Build the solution to make sure it still compiles without errors. Check in the bin folder of the project that the [projectname].dll file was created by the build process. I called my project KatanaBasics so I have a KatanaBasics.dll in the bin folder. You’ll need the path to the bin folder in the next step. Owin assemblies are updated quite often so it’s almost expected to run into this classic “Could not load file or assembly” error, although it’s really irritating. The output of our OWIN middleware has been successfully plugged into the IIS infrastructure. Now check if the web api controller is still responding on localhost:8080/latestnews. You should see that it does indeed. The OWIN project we’ve built produces a dll which can be referenced from any type of application: console, WPF, WCF, etc., it will always produce valid XML. How was our application configured correctly now that the Program class has been commented out? How was our Configuration method called now that there’s no code calling it directly? The Host.SystemWeb dll has a bit of code that will look for a class called Startup and run its Configuration method for you automatically. …where the value is the fully qualified name of the Startup class. If you don’t specify these values then it will try to find the Startup class through Reflection in the namespace matching the project name, in this case KatanaBasics. Since there’s one such class in that namespace, the web hosting process found it and executed it. Open the file and you’ll see the Configuration method which accepts an IAppBuilder object, so it follows the same pattern as we saw in our console based server app. The Configure method calls upon a method called ConfigureAuth. You’ll also notice the assembly metadata above the namespace that tells Katana where to look for the Startup class. Note that this is a partial class so there’s one more Startup class. You’ll find it in the App_Start folder in a file called Startup.Auth.cs. This is where the ConfigureAuth method is implemented. As the method name suggests ConfigureAuth defines some OWIN middleware that have to do with authentication. You can uncomment the rest of the code to activate either of the 4 available authentication providers: Microsoft, Twitter, Facebook and/or Google for OAuth2. We will look at these in a later series dedicated to security in MVC5. You can even load the entire code from Git. You’ll find the git clone command on the Codeplex page. I see that the MVC 5 app has still a reference to the old, big System.Web. Does it mean that it is still bound to IIS? Can an MVC5 app be hosted in a simple console app that supports OWIN (like in your ex)? Instead of wiring Http modules, or actions’s filters we use Katana’s App Funcs for the http request pipeline? The standard MVC5 project is still bound to IIS. 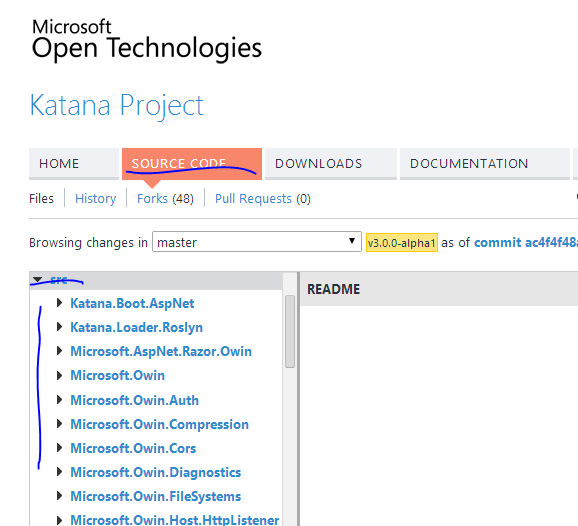 The way I see the current state of OWIN/Katana is that it’s only in an introduction phase. 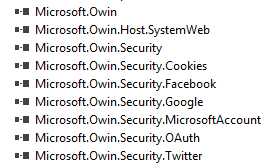 At present it’s only some authentication bits that are linked to OWIN from the start, the rest comes from System.Web. In the future versions of MVC this may change so that System.Web will become optional for those not willing to work with OWIN 100%. I think it’s possible to host a full MVC5 application building upon the example but you’ll probably have a lot of plumbing to do. LatestNewsController is an example of a controller, other controllers can follow in this fashion. Note that I’ve only experimented with OWIN so I’m not 100% sure how to build a full MVC site with OWIN middleware only which has the same functionality as a full-blown MVC app. Andras, this was a really useful series about OWIN and Katana, thank you very much. As of 6/2015 NuGet installs Web API 2.2OWIN Self Host. Not sure if this is why latestnews triggers a 404. Web service on http://localhost:7990 starting. No compile-time or run-time errors are thrown in the code. Has anyone else had this happen? Any workarounds? Thanks for your posts. Fantastic ! Hi Andras, thanks for the series of post was really helpful, to the point and fluent.